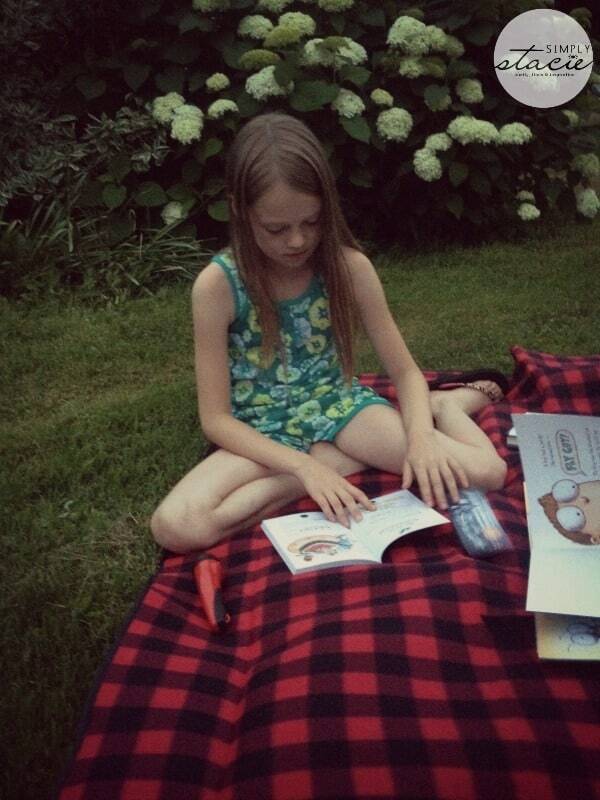 Last month I shared information about the Scholastic Summer Reading Challenge and how my daughter, Bridget, was taking part. Bridget is still reading before she goes to bed and was even inspired to create a journal to write down her thoughts and feelings. I’m very proud of her and she’s doing great on the challenge so far! My post goes into lots of detail on the Scholastic Summer Reading Challenge, but I’ll also recap it here too. The Summer Reading Challenge is now into its 8th year. The goal is to help stop the “Summer Slide” and get kids to read throughout the summer. It officially began on May 5, 2014 where kids can log their reading minutes both online and via an app on a smartphone. Their minutes will count towards breaking the World Record for Reading, entering sweepstakes and earning digital rewards as they complete weekly reading challenges. Last year, Scholastic inspired more than 130,000 kids from 4,200 schools in 31+ countries to set a new world record for summer reading. They read a whopping 176 million+ minutes! 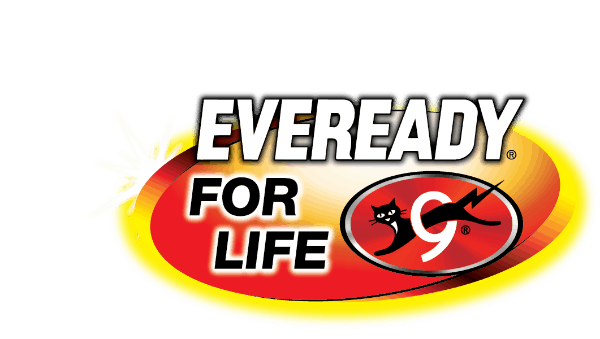 This year the challenge theme is Reading Under the Stars and is powered by EVEREADY. Kids will read around the galaxy and unlock star constellations as they log reading minutes. My niece, Avery, was visiting from Ottawa for the weekend and she came to stay with us on a Saturday night while her mom went out. 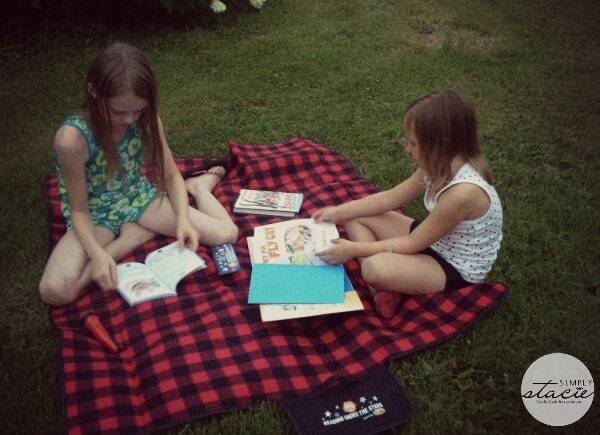 I thought it would be fun for the girls to have a Reading Under the Stars party in our backyard. The weather was warm even in the evening hours and our neighbours next door were already having an outdoor pool party. 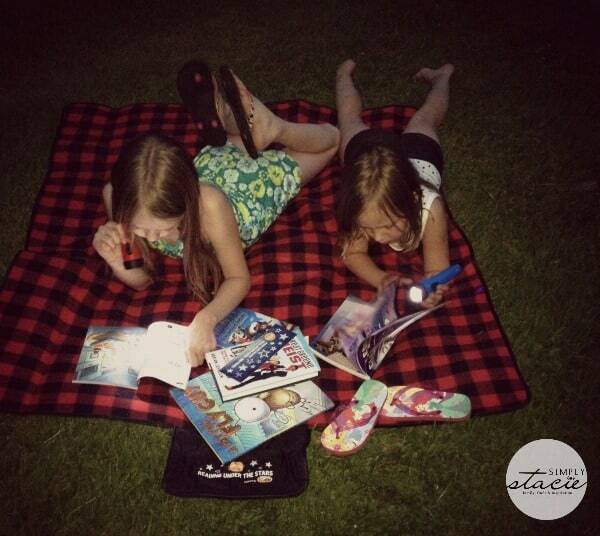 It seemed like a festive evening and perfect for the girls to spend some time under the stars with books. 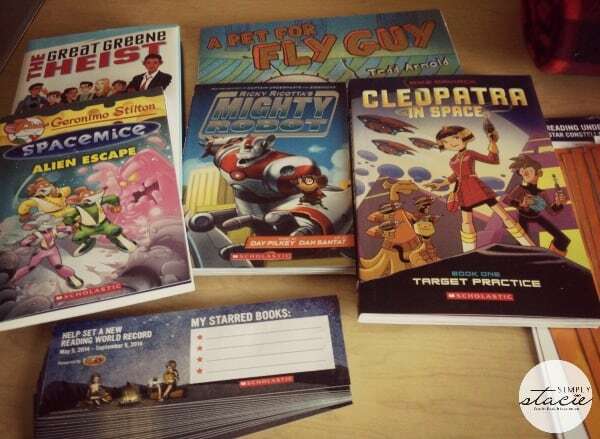 Scholastic sent me everything I would need to host my own Reading Under the Stars party. I had a blanket for the girls to sit on, lots of books, posters, bookmarks, handouts about constellations, etc. The books all fit the “space” theme of the challenge and the party. Since it’s a party in the evening hours, we needed flashlights so the books can be read. 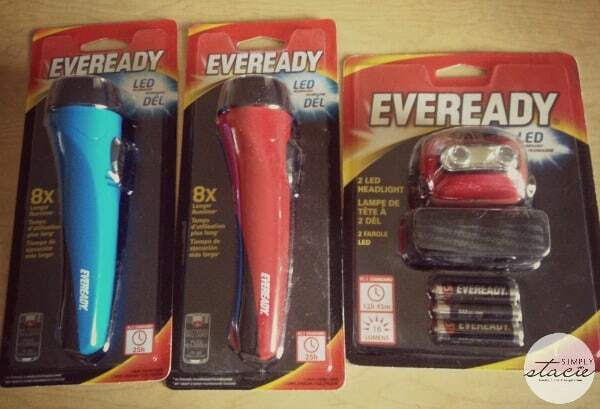 EVEREADY sent us a variety of flashlights and batteries to keep the party going even when it’s dark outside. The only other item that you will need is bug spray! The mosquitoes are really pesky at night. I set everything up outside in the backyard. Avery and Bridget were really excited about their party! Avery is 6 and looks up to Bridget as a role model. I was glad to see Bridget’s love of books is rubbing off my niece. The sun was just starting to set when the girls started reading their books. I sat out in the backyard with them to keep an eye on them. Mostly I left them alone and snapped pictures quietly so I wouldn’t disturb their concentration. Avery is an excellent reader for her age. She told me she’s already reading chapter books. The highlight of the night for the girls was when the sun set. 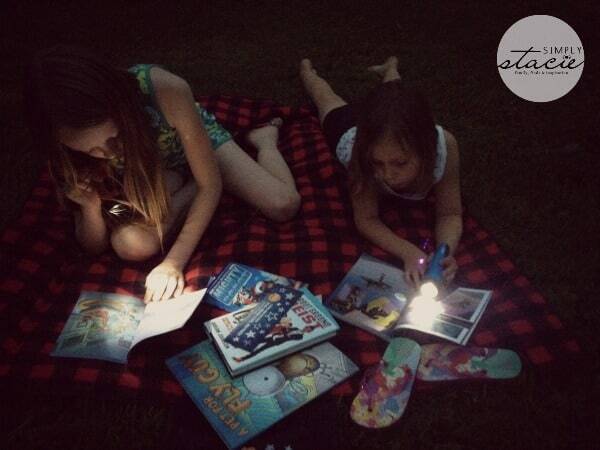 It was getting too dark to read so out came the flashlights. Both of them thought it was a pretty neat experience! Avery was getting tired so we had to end the party. I have to say she was easy to put to bed that night. She asked me if she could go to bed! How often does that happen?! The next day, Avery told her mom about the party and how she and Bridget spent time in the backyard at night with books and flashlights. They both enjoyed themselves and asked if we could do another party when Avery comes back for a visit! 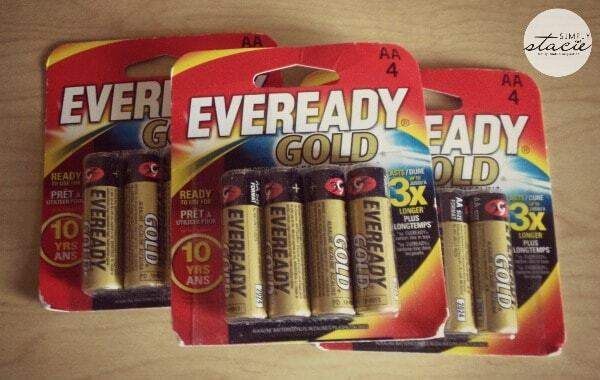 I said sure, we have lots of books, flashlights and batteries! 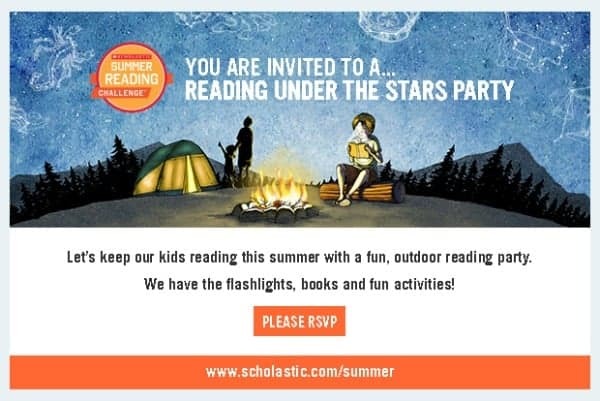 Do you think your kids would enjoy a Reading Under the Stars party? This is a fun way to promote family togetherness, take turns reading to one another outside around a fire or even a dim light. Great summer memories. Summer reading is great! This is a very good promotion! This is such a cool idea, and a great way to add a bit of fun if your child isn’t a book lover! Summer Reading Programs are great and our public library offers one every summer. What a great idea to get our children to read real books. That’s awesome! I would’ve loved this as a child. I’ve always loved reading. I love Scholastic books while growing up. 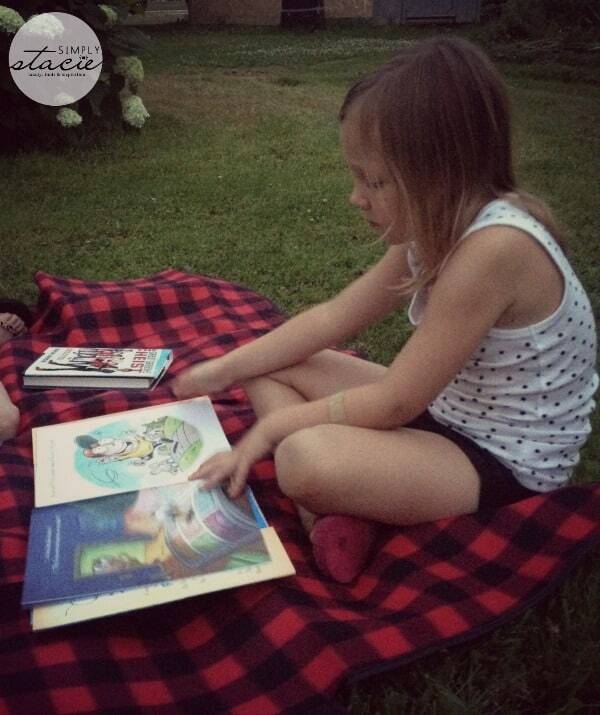 Reading under the stars is a cool idea!